Kalanda Review 2019: Is Kalanda a Good Hosting? Kalanda is a France-based web hosting company. It offers VPS and dedicated server solutions. This vendor’s hosting solutions are designed to ensure near zero interruptions of its services through modern redundancy protocols. Kalanda is a web hosting company based in France. It was started in 1996 as a software design company. However, the firm shifted to the provision of web hosting solutions to businesses in France in 2001. The vendor offers VPS hosting, dedicated servers, colocation services, and cloud servers among other solutions. 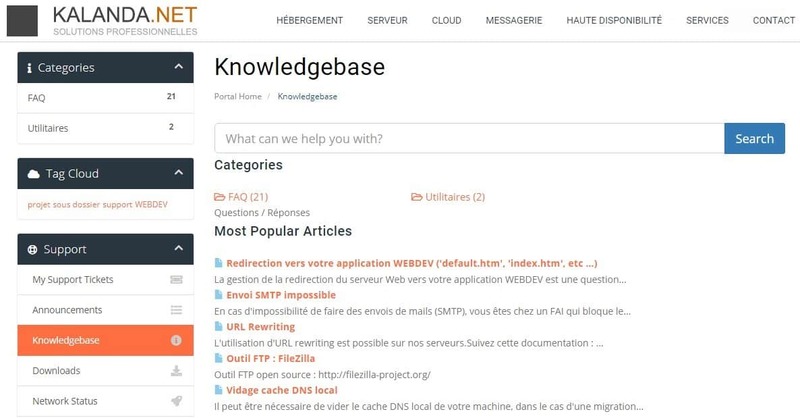 The vendor’s website is only available in French. Kalanda has invested in its infrastructure so as to provide quality services. The vendor has equipped its data centers with redundant power supply and put in place strong security measures. It has 30 interconnected data centers. Kalanda favors the use of low energy footprint technologies for greener, environmentally friendly hosting solutions. This vendor’s hosting solutions are designed to ensure near zero interruptions of its services through the modulation of power and functionality, as well as other modern redundancy protocols. Kalanda offers a customized web hosting solution where users choose the resources and features they want based on the demands of their website. Its VPS solution is available in three packages: Serveur VPS Baby, Serveur VPS Starter, and Serveur VPS Middle. 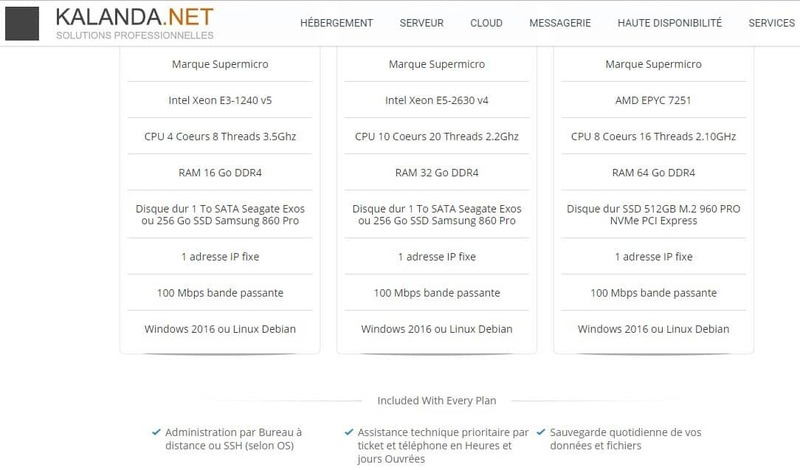 Serveur VPS Baby is its most basic VPS plan. It comes with one vCPU, 2GB RAM, and 100GB disk space. Serveur VPS Middle is its most advanced VPS plan. It comes with four vCPU, 8GB RAM, and 400GB disk space. This vendor does not offer free backups. Instead, clients have to pay extra to access this solution. This paid backup plan includes performing backups in the background as well as a seven-day retention plan of all deleted files. Kalanda offers an annual availability guarantee of 99.99%. If you factor in the fact that Kalanda’s hosting solutions come with a considerably small number of features that have significant restrictions, then it is true to say that the vendor’s hosting services are expensive. On its website, the hosting provider has listed the prices of its packages in euros. Kalanda does not offer any money-back guarantee and its uptime guarantee is not backed by a compensation plan. Customers wishing to can contact this vendor’s support team can do so via telephone, email, fax, and ticketing system. While the vendor offers 24/7 customer support, its phone support is only available Monday through Friday from 9:00 a.m. to 5:00 p.m. CET with a lunch break of one hour in between. The vendor does not have a live chat on its website, and unfortunately, my email to this vendor’s support team went unanswered. The most effective way to get a response from this firm’s support team is to pay them for premium support; the vendor allows its customers to fast-track their support tickets at a fee, and the fee is notably quite high. The Kalanda website has a limited knowledge base. Kalanda web hosting company seems to have the expertise and the experience to offer quality hosting solutions to businesses of any size. That said, the decision of this vendor not to offer a money-back guarantee and its unresponsive support team can be unsettling. All the same, the vendor offers decent VPS and Dedicated server solutions. Wondering how Kalanda stacks up against other Web Hosting companies? Enter any other Web Hosting company and we will give you a side-by-side comparison.